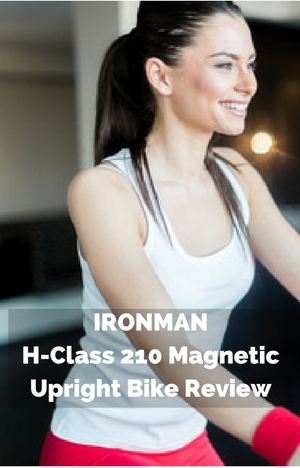 IRONMAN H-Class 210 Magnetic Upright Bike has a name that suggests toughness and endurance. It is a lightweight for a tough exercise bike which can make you wonder if it has the strength for long use and standing up to punishment of workouts. It comes with a good console that gives you a choice of 21 workout programs to keep you interested and challenged. There are 24 levels of resistance for working out at the intensity you want and it can be adjusted to get the best fit for a range of different heights. And all this at an affordable price too. It has much to commend it. But the bike isn’t for everyone and it won’t cater for all types of workout. In my review I take a look at this and how well it lives up to the promise of the name in delivering a a low impact cardio workout in your home. The bike has a good solid constructed frame and stabilizer bars to hold you steady as you workout at the intensity of your choice while in the seat. It’s not built for standing on the pedals and if you do you may find it wobbles more than you’d like and it may not be as durable too if you do this for prolonged periods. The end caps on the back stabilizer have level adjusters that you can turn to help to level up the bike if the floor is uneven to stop the bike from rock from side to side. Putting it on a rubber mat can also help with this too. The bikes warranty is lifetime on the frame, wearable parts and electronics is 1 year, labor and other parts is 3 years. This is a good length warranty for a bike in this price range below $300, most of them are at best a year for the frame. The bike hasn’t been available long enough to get feedback from customers as to how the bike is lasting in the long term . They do say they are impressed by the build and quality of the bike. (The company say they’ve tested it for durability, performance and endurance.) It seems it will get the job done for a number of years based on initial reviews. Making the seat adjustment is quick and easy enough for anyone to do – so that it can be used by multiple users – it doesn’t really get in the way of people getting on with their workout – it can be done in a few seconds. You may want to mark the pole with permanent marker to set the height for each user as they aren’t marked. The adjustment do need to be done while you are off the bike. It uses a standard method of adjustment knobs with holding pins in them that are inserted into pre-set holes in the seat post to hold it in place at the selected height. The adjustment has to be done before you get on the bike. The 24 magnetic resistance levels are controlled through the console. You press the up/down buttons to change the resistance level. When using one of the pre-set programs the bike automatically adjusts the resistance level as you progress through the program. If the resistance is too easy or too hard you can adjust it by pushing the up/down buttons on the console. The movement between the levels is smooth without any jerkiness. They go from very easy with a feeling of almost none to very hard at 24 which should be very challenging for all but the most elite who may want to be out of the seat (which isn’t what the bike is designed for). The set of magnets that provide the resistance are moved closer and further away from a flywheel without ever touching it. This makes it very quiet and low maintenance. At the higher levels of the resistance you may notice the pedaling motion start to pulse a little with the resistance slowing the pedals around the top/bottom of the stroke. It can promote a bit of an up/down stroke which isn’t as low impact as a 360 degree stroke so you need to concentrate on improving your form. The bike has a belt drive and flywheel to provide the pedaling motion. It operates very quietly and is low maintenance with no ongoing work required. This is all enclosed in the shroud at the bottom of the bike which protects it from dust and dirt. The shroud also keeps these moving parts away from children and pets. The large pedals, straps and 1 piece crank give a good platform that is solid without flexing so you can exercise and push against the top resistance without issues. There should be no issues with them breaking when used as designed for pedaling in the seat. The pedals are designed to work with athletic shoes or similar. The crank won’t take standard fit bike pedals as it has a one piece crank and these usually have a 1/2 inch thread. Seat. The seat is padded and has a little contouring. For some the seat it is good enough for them to get workouts for as long as they want without suffering from pain or numbness. But, like all bike seats, not everyone is going to be a fan and they will find it tough on their sit bones. If you’ve not used to riding a bike it might just need a little time to get used to it. If that’s not the case then padded bike shorts or a gel seat cover can often be what is needed to make the seat bearable so you can get a good workout without numbness and pain. However, if that doesn’t work it is possible to replace the seat. But, this is not straightforward to replace the seat as it doesn’t have a standard bike fitting. It has 3 screws that attach it to the seat post. If you are handy it is possible to attach a seat. If not, you can buy a universal exercise bike seat adapter so that you can then fit standard bike seats to it, to get a more comfortable one. Or you can go to a bike shop and they should be able to sort it for you. The handlebars are covered to provide a good grip at all times even when your hands are wet they shouldn’t slip and it will help to prevent blisters forming. You can lean on them but they aren’t cushioned so you may find your arms ache if you do this from a long period of time. Noise. The bike operates very quietly. You can use it any time day or night and you shouldn’t disturb anyone – it shouldn’t wake a sleeping baby or others. If you want to watch TV you can do that without having to turn it up. It makes it ideal for apartments too, as it is also fairly compact. You neighbors won’t hear you whenever you workout. If you do live on an upper floor a rubber exercise mat will stop any slight noises being heard below. This bike can’t be folded down when not in use. It needs an area of 33 by 21 ins for storage. It might fit in a large closet but normally it is stored in a corner or by the wall. It’s not a huge piece of equipment and some people leave it out even in the living room as it doesn’t really overpower the room – and it can be there to remind you to get on it and exercise. There are transport rollers in the front stabilizers which is easy to tip the bike on to and move the bike where you want to go with it on the same level. They hold most of the weight and it can be done by one person. It weighs 53 lbs so it will probably need two (or more) of you to carry the bike up or down stairs. The wheels will work well on most surfaces except soft carpet where the wheels won’t have enough clearance and you’ll probably end up having to slide it if moving on your own. They work fine on wood floors but it may pay to be a little cautious as they may scratch or dent it. The bike comes with the most difficult part (drive assembly and frame) of the bike put together and requiring you to finish off the assembly. This includes adding the stabilizer bars, pedals, front post, handlebars, console, seat post, seat and water bottle holder to the bike. It can be done by one person but it is easier with two – so that one can hold the pieces in place while the other bolts them on. The instructions and diagrams are clear making them easy to follow. The tools needed for the job are included – they are good enough to get it done but you may find if you have your own that you can finish up quicker. Apart from the bolts needed for the first step of the assembly the hardware is already attached to the pieces. It does save the job of finding and sorting them to start the job and then wondering if you have the right ones when they look similar. It can make it a little bit of a pain having to remove them first but I think it’s better overall. Most can get this done in an hour or two with some getting it done in half an hour. It’s not that difficult and if you have put together IKEA furniture, it is easier than that. If you are still unsure about this you can order assembly through Amazon which does cost extra. It seems to be a good service. It saves you time and there is no need to worry about doing the assembly if you don’t enjoy that sort of thing. It’s not the best looking console and looks a little cheap but it does a good job. You can read your progress easily with the display showing program, progress through program, resistance level, time, speed, distance, calories, RPM and odometer (cumulative distance) and pulse. The backlit display means you can see it whatever the light conditions are – there’s no being left in the dark as to your progress. It also has 20 pre-set workout programs and a manual one to provide plenty of choice and variety to help you stay motivated and challenged. There isn’t the ability to store your information to keep a record of your workouts. This has to be done manually. You can’t upload to a fitness account or App. The 20 different profile programs you can choose to use give you plenty of challenge and variety. They work with time segments that you pedal against a certain level of resistance and when you go to the next segment there will be a different resistance level. Mode – this used to change the values displayed – RPM to speed, odometer to distance and watts to calories during your workout. Up – for selecting program, workout target value and increase resistance. The other 20 have pre-set levels. You can see the profiles of the programs in the manual and on the screen. There is a good range of programs that cater for different abilities and goals. When you start the console the first program is shown – the manual one and you can then choose this or use the up/down buttons to move through them to the one you want. Once you select the program by pushing the enter button you can then choose a target time, calories or distance or you can set one for each. If you have multiple targets you have to press the start button twice to continue on with the workout. There aren’t any heart rate control programs that adjusts the resistance to help to keep you in a selected heart rate zone. The only program that uses your heart rate is the recovery test and that is in addition to the 20 pre-set profile programs. You start the test by pushing the recovery button after your workout for a peak heart rate and hold on to the pulse sensors for 60 seconds – it is measure of how quickly you recover – the lower the score the fitter you are. You can’t set up and save a customized workout – you can only use one of the pre-set programs. To monitor your heart rate you do need to hold on to both of the hand pulse sensors in the handlebars. This can be restricting if you like to monitor your heart rate as you workout. On top of that, like all hand pulse sensors in all bikes they can’t always be relied on to give you a reliable reading. Some people can get a successful reading but many can’t. If this is important to you it is better to get a heart rate strap and monitor to do this independently of the bike. Or you can buy an upright exercise bike that is compatible with a heart rate strap like the Schwinn 170 but this can cost about $100 more or less dpending on deals (it does come with heart rate control programs as well as profile programs). Media Shelf. It’s part of the console and is a good size for a tablet or kindle so you can read or watch movies as you exercise. When you put a small tablet or similar device it covers up the buttons so you can’t make changes but can still see how you are doing without removing it if placed landscape..
Water bottle holder. This is on the front post, as it is with most of these bike. It puts the bottle in easy reach but you may find yourself slowing down when you grab it and replace it just to make sure you get it in and out properly. It will fit a small water bottle. The bike doesn’t have a huge amount of customer reviews but of the ones that have been left (22 when I wrote this) the majority were positive with 86 % rating it a 4 or 5. The 2 that weren’t happy about the bike have had problems with the computer or motor not working after assembled. It’s not a common problem so far and apart from having to pack the bike up (which happens with all bikes if there is an issue and none get it right all the time) they’ve had good service. One other review didn’t like the seat and marked the rating down for that. This can happen with any bike that the seat isn’t comfortable – there are things you can try to help with this. And some find the seat comfortable. Most people say the bike is well constructed, solid , quiet, they like the console programs and that they can get the exercise they want when they want. You do get a number of good features for a reasonable price at around $200 (or under) give or take depending on deals. With the pre-set programs, large pedals, 24 levels of magnetic resistance and belt drive which all make it good value when compared to alternatives. When I was checking at Amazon where it qualified for Prime and free shipping on eligible orders. IRONMAN H-Class 210 Magnetic Upright Bike is great for those looking to get started up to those looking for medium hard workouts – although the resistance does get hard for hill climb training. I say it’s not really for those looking for the toughest or challenging workouts because it’s not made for standing up out of the saddle on the pedals – if you don’t want to do that it can still be demanding except for the best atheletes. It’s quiet and easy to move. There isn’t a lot of maintenance or cleaning requirements. It’s compact. It all helps to make this a good bike to fit in your home and allowing you to get a good low impact workout at the level you want from casual to more serious. And it saves going out in bad weather conditions or having to pay the monthly fees for the gym.